Ever had the feeling you’d like to get away for a while, enjoy some peace and quiet where no one can find you or bother you? One way is to take a cruise. No, not the kind of cruise where there are a thousand passengers on a fancy ship with shuffleboard games, casinos, floor shows, fancy dinners, organized tours ashore, hundreds of hotties in Speedos sunning on the decks all day (could be men or women; this is an equal opportunity website). Nah, none of that boring stuff. Just peace and quiet. Book yourself for a trip on a freighter. Maybe one of those giants with containers stacked all over the place or, if you prefer, some other kind of cargo ship. 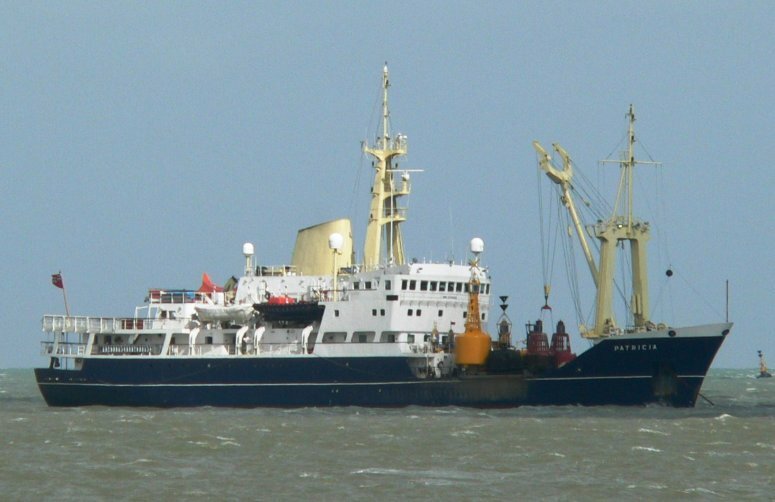 (A good choice for poking around the British Isles might be the THV Patricia, above.) There are usually only a few passengers, meals are included in the price, you get to eat and hobnob with the crew, and you can do nothing but take it easy. Read about freighter cruises in this article, and check out FreighterWorld.com and FreighterCruises.com. And the trips can be anywhere from a few weeks to months long, going to virtually any destination in the world. I always knew this was possible, but I’d never seen the details. There are times when this seems like the ideal way to escape, just for a while. Maybe someday…. Tom, I have never heard of this. It seems like a great alternative to cruise ships for people who do not like crowds and glitter. Thanks for sharing. I’d heard that you could travel on a freighter, but I didn’t know any details. Then I came across the article. I don’t know that it’s much cheaper than a cruise ship, but it has a certain exotic appeal. If I ever do it, first I’ll go on a trip of a couple of weeks instead of a couple of months. I’m not sure when boredom would set in. I think the ideal trip would be on a ship going through the Panama Canal — maybe something going from the U.S. east coast to the U.S. west coast. I’ve watched many ships go through the Canal, but I’ve never been on a ship that made the transit. Yes, that would be a fantastic trip going through the canal especially if you could stop off on a tropical shoreline. I researched those links you provided and it appears that there may be a considerable difference between one freighter and another. But that is the same of cruise ships even within the same company. Here I am speaking authoritatively and have not been on a cruise but there was a time when I did the research.